April 01, 2015, 3:11 p.m. Polls almost never ask questions about flying except after air disasters, and so there is no real trend on how Americans view flying. In the aftermath of the September 11, 2001 terrorist acts, fears of flying rose, but since then only half (and often even fewer) of Americans have expressed even slight concerns about flying. The 9/11 attacks shook Americans. But this week’s Economist/YouGov Poll suggests that last week’s GermanWings crash, believed to be caused by the co-pilot deliberately crashing the plane into the Alps, also bothered the public. 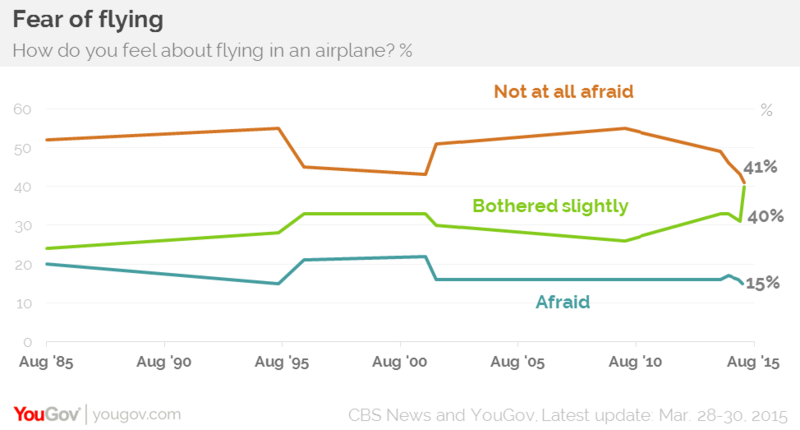 Those saying they are “not at all afraid” of flying is lower than ever in Economist/YouGov Polls, and just as low, if not lower, than in the week’s following 9/11. More than half are troubled; and while fewer admit they are afraid of flying now than after 9/11, more admit flying bothers them slightly. The only other time in this series of polls (which includes the same question asked in CBS News Polls) when a majority expressed concern about flying was in 1996, after the crash of TWA 800 off Long Island. In the weeks following that crash, there was speculation that the plane, which exploded in the air, was brought down by a terrorist attack. The Transportation Safety Board later determined the cause was a fuel tank explosion. The 9/11 attacks were deliberate acts by those flying the plane. At first, the 1996 TWA crash was thought to be the same. And both of those events took place in the United States, making them very real for Americans. 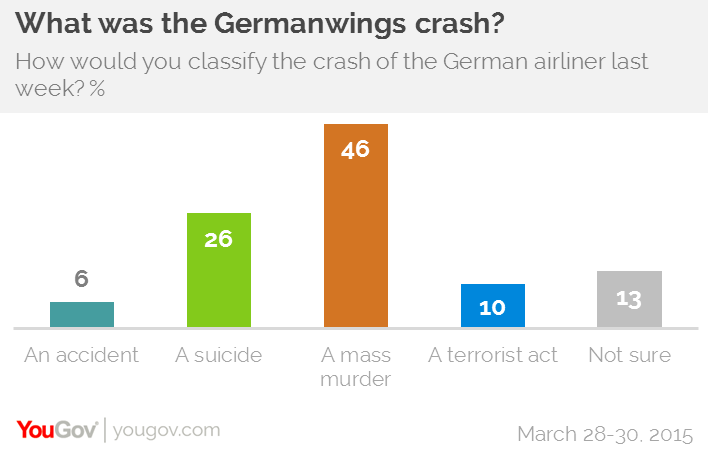 The GermanWings crash, though it happened in France, is also being described as a deliberate act, and the vast majority of Americans not only agree, more than half say it was criminal. Only 6% think it was an accident. There are significant gender differences in the response to the crash. 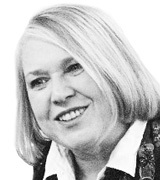 Women are far more likely than men to express concerns about flying. Nearly two in three women are afraid or bothered by flying, something less than half of the men in this week’s poll will admit. 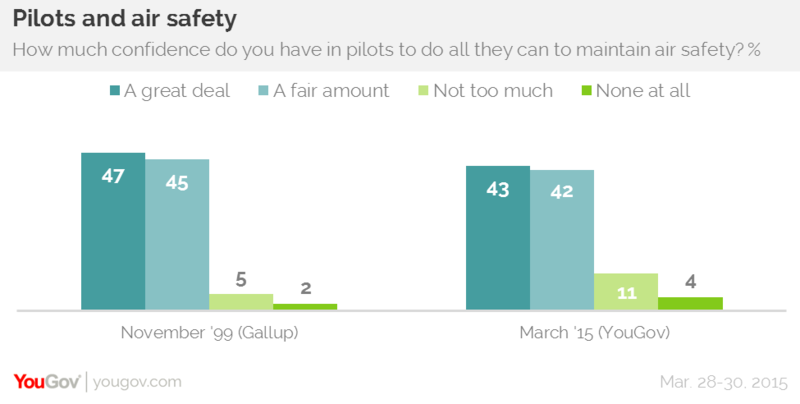 Still, Americans remain fairly confident that airline pilots in general maintain air safety -- nearly as confident as they said they were when Gallup asked the same question 16 years ago. 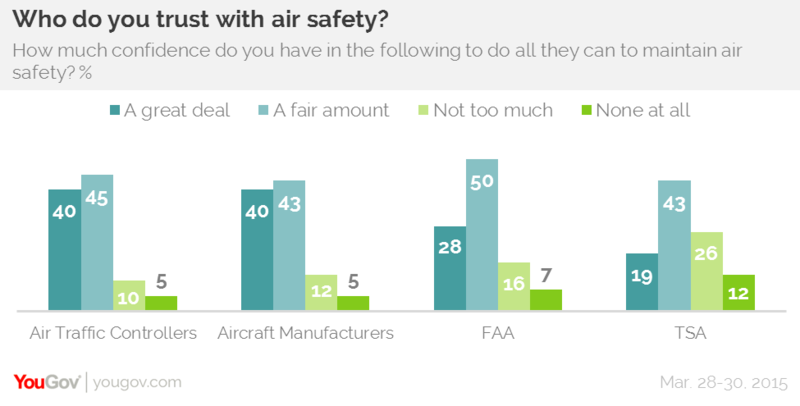 The percentage having not much or no confidence is twice as high as it was in 1999, but 85% continue to have a great deal or at least a fair amount of confidence in in pilot safety. There are similarly high levels of confidence when it comes to airplane manufacturers and air traffic controllers. There is somewhat lower confidence in government agencies involved in air safety, particularly the Transportation Security Administration – the TSA. Some of that is political. One in four Republicans have little or no confidence in the Federal Aviation Administration (the FAA), and 40% little or no confidence in the TSA.